Kaila Flory lost her baby to a uterine rupture eight months ago. She recently reached out to me and gave me permission to share her story and pictures of her son Beau. She is currently raising money to purchase Cuddle Cots in Beau’s memory. Cuddle Cots are refrigerated bassinets that enable loss parents to spend more time with their child. While t-shirt sales end on April 22, 2016 at midnight EST, you can donate anytime. Even just $10 will get her closer to her goal. Buy a t-shirt and/or donate here. Connect with her Facebook page here. Women who have had uterine ruptures and lost their babies have endured some of our greatest fears. But they are part of our community as well. When the VBAC Facts Community, a Facebook group, was opened to the public, we welcomed and embraced the parents who joined us after their loss. Often they felt like they were no longer part of the birth community. They didn’t know where they fit in. They felt isolated and yet they wanted to share their story. We had many loss moms as members and many parents who were planning VBACs who wanted to hear their stories. What follows is Kaila’s story. Her father called the paramedics and she was rushed to the hospital, where a STAT c-section was ordered. She nearly bled to death. While I wholeheartedly believe that women should be given the option for VBACs, I also believe women need to consider their child’s health as the most important in this situation. I would have loved to have 3 weeks of pain just to have my son in my arms. I know it is not my fault, and that they do not, normally, schedule a c-section until 39 weeks, but part of me still feels guilty. Thank you so much for sharing your story with me and I am so sorry about your loss. I want you to know that I hear you. I really hear you. I talk quite a bit about how these small numbers represent real women and real babies and it doesn’t matter how small the risk is, if it happens to you, if you are that number, it’s devastating. The difficulty is that there are serious risks both ways. 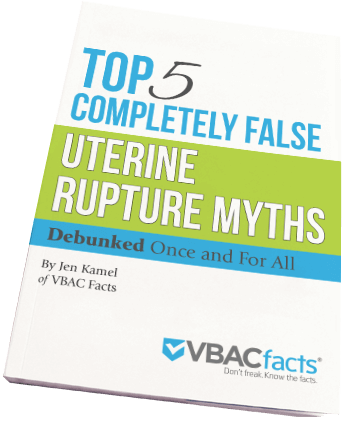 With VBAC, we have uterine rupture. With repeat cesareans, we have accreta. I discuss uterine rupture and accreta extensively in my workshops including how often it happens, variables that can impact the rate, and outcomes for mother and baby because there is so much confusion about where the risk lies and what could happen. The other difficulty is that no one can predict how an individual birth will play out. Will you be the one to have a uterine rupture? An accreta? And in either of these situations, will you be the one to lose your baby? Or will you have a safe VBAC or repeat cesarean with a healthy mom and baby? There are no guarantees in life and no crystal balls. So the question is, if there are serious complications either way, who should make the decision on how to birth? It always comes down to the mother. Given the small chance of a bad outcome, women should have the option to decide what set of risks and benefits are tolerable to them. They should not be forced into cesareans or mislead into VBACs. This needs to be their decision based on information. Part of the reason why I started VBAC Facts is that I, as a consumer, wanted more information and it wasn’t easy for me to find. To bring it full circle, I hear you. Have you had the opportunity to connect with other loss moms? I have compiled a resource page here. I know it may ring hollow, but you are not to blame. Sometimes things happen that we cannot predict and that are outside of our control and I’m so very sorry you were the statistic. So I’m sharing Kaila’s story today. As I said in my email to her, I talk about the risks of uterine rupture and accreta in my workshops because they are both real risks on either side of the equation. Sadly, a small number of people will experience this reality, and they deserve our support and compassion. I do hope you will support Kaila’s Cuddle Cots fundraiser. Even just $10 will get her closer to her goal. Donate here. Connect with her Facebook page here. Learn more about Infant Loss Awareness here. I appreciate you article. I have 4 children and am pregnant with my 5th. My first 2 babies were breach and were delivered by C-section my third baby was in regular position and if I had tried a VBAC, I would’ve been that statistic of uterine rupture. I didn’t know during my pregnancy but my uterus was so thin that I had a window meaning you could see the baby through my uterus. I am so thankful that I listened to my dr and didn’t try a vaginal delivery! With my 4th baby I was on bed rest, and I’m sure I will have to be with this baby, I’m 28 weeks, but again I am so great flu that I listened to my dr, otherwise I would have lost my 3rd baby and not have had the chance to have my fourth or fifth!